A 73-year-old South Korean man has been fined for spreading rumours online that the widow of a late president was going to marry rap legend Dr Dre. The unnamed man had said the marriage was intended to launder "slush funds" he alleged belonged to the former leader Kim Dae-jung. Mr Kim's widow, Lee Hee-ho, is 95 but remains influential in South Korea. The Seoul district court ruled on Friday that Lee "violated the honour of the deceased and the bereaved". "The rumour about the slush fund and the marriage between Lee and Dr Dre is groundless," said Judge Lee Eun-hee, fining Lee 5m Korean won ($4,400; £3,410) for defamation. It's unclear, however, whether anyone ever fell for the news of the unlikely romance. 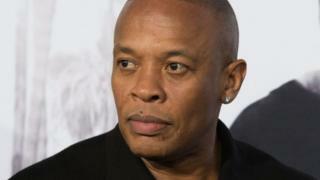 Dr Dre - real name Andre Romelle Young - is a towering figure in the rap world. He was a founding member of groundbreaking gangsta rap troupe NWA and went on to found Death Row records, which counts Snoop Dog, Tupac Shakur and Young Soldierz among its artists. He is now one of the world's richest music stars, in part from the sale of Beats Electronics -makers of his cult headphones Beats by Dr Dre - to Apple in 2015 for $3bn. Mrs Lee, meanwhile, was first lady of South Korea from 1998 to 2003. Her husband's term in office was characterised by his Sunshine Policy, which encouraged engagement with North Korea. He won the Nobel Peace Prize in 2000 for his efforts. Mrs Lee has remained influential and has twice visited North Korea since her husband's death in 2009. It is unclear whether she is a fan of Dr Dre's work. NWA: The World's most dangerous group?